At first, healthcare professionals and nutritional bodies thought that fructose can be a good replacement for sugar, since it does not increase the blood glucose levels massively. However, after some years of research the American Diabetes Association and Healthcare experts changed this notion – fructose is not as innocent as they thought. Fructose is a simple sugar, the so called monosaccharide, which is used by the body as a source of energy when needed. How much fructose is bad for you? Although a small amount of fructose is not so bad to be included in your diet, such as in most vegetables and fruits, there is evidence that too much fructose can cause health related problems. In fact, fructose helps your body to digest glucose in a proper way. However, fructose in excess amounts can overwhelm this action. If we compare the levels of fructose in our diet with that of our ancestors, we will see that our ancestors were eating only small amounts of fructose daily while nowadays, fructose comes up to 10% of our daily food. How can fructose affect your health? Let’s see first what happens when we consume carbohydrates which are made of glucose. As soon as glucose enters our bloodstream, it releases insulin, which in turn is regulating the amount of sugar in the blood. On the other hand, fructose will be processed in the liver. The problem does occur when the amount of fructose that enters the liver is much more than the amount your liver can handle and need. Since the liver cannot process the excessive fructose that entered into your body, and use it as sugar, the excess fructose follows a different path. Specifically, your body will start making fats from the surplus fructose and it will send them back to the bloodstream in the form of triglycerides. What’s more, fructose is affecting the appetite signaling system differently than glucose does. Specifically, the hormones that regulate the appetite are not triggered properly when fructose is consumed and thus, your body is left feeling unfulfilled at the end of a meal rich in fructose. Thus your calorie intake might be automatically higher if your meals are high in fructose. This is probably why most health professionals believe that fructose can cause weight gain. High amounts of fructose can also affect blood pressure. According to research, excessive fructose increases blood levels of uric acid, which in turn causes elevated blood pressure. Fructose can also cause insulin resistance. Insulin resistance can lead to obesity and diabetes (Type II). Excessive fructose intake may have an effect also on leptin resistance. Since leptin is a hormone that is regulating your body fat storage, surplus fructose consumption may deregulate this action, and end up contributing to weight gain and obesity. Which are the main sources of fructose? Firstly you need to know that fruits and vegetables have relatively small amount of fructose that our bodies can manage and handle efficiently. The problem starts when modern diets are fortified with added sugars, the level of which has grown rapidly during the last years. Most people and scientists talk about the high fructose corn syrup. 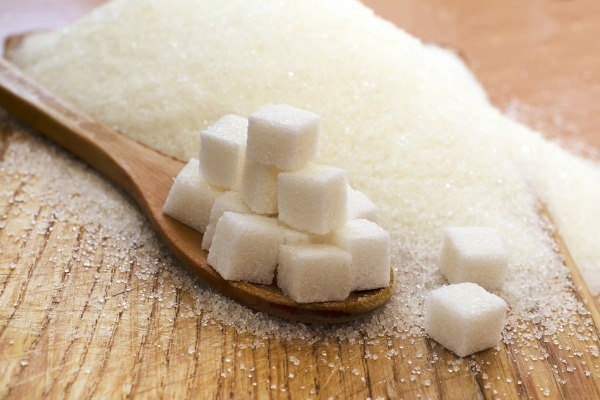 This additive is made up of approximately 55% fructose and 45% glucose. This means that HFCS has not much more fructose intake than the regular white sugar (50-50). However, HFCS has been added to many of our daily foods, since it is very cheap as an additive and offers sweet taste. Thus, really, the problem is that it has been so inexpensive and has been added to a huge amount of foods we consume daily. Which foods are rich in HFCS? Nowadays, most packaged foods are rich in added sugar in different forms. These forms very often include fructose. For example, honey contains the same ratio of glucose-fructose such as HFCS. Another product rich in fructose is fruit juices ready-to-drink from the supermarkets. These juices contain high levels of fructose, and most of the times are low in nutritional values. To make sure that you are not consuming too much fructose, have a look at the ingredients list of any packaged food that you are about to buy. Check for sources of fructose. These might be: HFCS, glucose, honey, maple syrup, maltose, fruit juice concentrate, dextrin, corn sweetener, dextrose, lactose etc. It is crucial to know that your body won’t care about what is written on the label. It consumes all of them at the same way as for sugar does! Is 2tablespoons of honey too much of fructose for an obese person trying to lose weight,having high triglycerides? While no other form of artificial sugar is taken?